It’s been well over a month since we checked in with construction at the Omni Louisville Hotel in Downtown Louisville, and in that time the 30-story tower has risen off the ground. These things go fast when there’s minimal ground or subterranean work like an underground parking garage. So expect some dramatic concrete work to quickly rise up this summer. The construction site as of last Thursday was distinctly vertical, resembling a sort of concrete hair growing upward from the former Water Company Block bound by Second Street, Liberty Street, Third Street, and Muhammad Ali Boulevard. Many columns will hold up the second floor ballroom space, which will have distinctly fewer columns. To bridge the enormous ballroom spaces and support the roof, a large steel structure will eventually be installed. Meanwhile, the L-shaped tower will continue to rise around the ballrooms. The structure was designed by the hospitality division of Texas-based HKS Architects and interiors are the work of Dallas’ waldrop + nichols studio. Birmingham, Ala.–based Brasfield & Gorrie is serving as the project’s general contractor. Check out the latest interior and exterior renderings of the project from our coverage of the project’s ceremonial groundbreaking on January 29. A newsletter from Omni sent to the Courier-Journal and Business First reports that construction progress is moving along on schedule to make its spring 2018 grand opening. 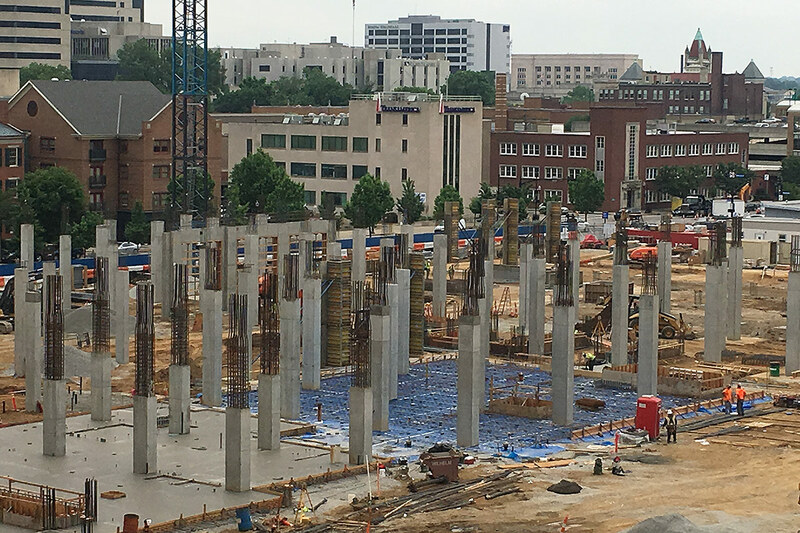 That newsletter described what’s clearly visible on the site: that work on the structure’s auger-cast foundation is progressing and vertical support columns are rising off the ground. Omni Project Manager Jeremy Dawkins said construction activity will pick up this month as the tower conspicuously rises into the sky. The construction newsletter went on to note that the project will require over two million linear feet of wire and half a million feet of conduit, according to Evelyn Strange, president of Louisville-based Advanced Electrical Systems (AES). If you see anything noteworthy at the Omni Louisville Hotel Site or anywhere else around town, drop a note in our tipline or to tips@brokensidewalk.com.